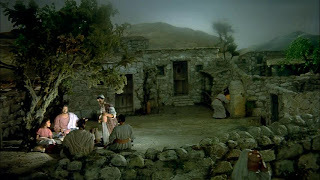 We watched The Miracle Maker yesterday at our Palm Sunday church social, and even though it was perhaps the 5th or 6th time I have watched it, I was pleased to see a number of details that I hadn't noticed previously (see my review, scene guide, podcast or all my posts on this film). It did make it all the more disappointing that most of the adults present wrote it off as a kids film and went out for a chat instead, but it was a lovely sunny day so who can blame them? The first thing I really noticed was the scene with Mary and Martha (and, in this case, the still alive, Lazarus). As with the gospel accounts, Mary sits and listens whilst Martha complains "Jesus don't you care that my sister has left me to do everything tell her to help me". But whereas the response recorded in the gospels rebukes Martha and exemplifies the behaviour of her sister, her Jesus solely focuses on Martha, saying to her "don't miss the one thing that matters for you". There's no mention of Mary choosing correctly. I'm not sure whether this reflects the film makers' desire not to draw attention to Mary, or whether they thought this lack of comparison with Martha's sister portrayed Jesus's actions as kinder, or whether it was something else entirely. Of course the female character that we see following Jesus most closely is that of Tamar - Jairus's daughter - who gets raised from the dead about halfway through the film. Poignantly, however, the film follows this scene with the moment that Jesus hears that his cousin John the Baptist has been killed. The contrast between the joy of raising a child to life and the grief and fear of knowing his kin and forerunner has been killed, not to mention that between the person he was able to save from death and the person he wasn't, is nicely highlighted by the juxtaposition. Jairus ultimately becomes the unnamed follower of Jesus who is walking with Cleopas to Emmaus on the day of Jesus's resurrection. However, Jesus seemingly knows this in advance. When Jesus arrives in the Garden of Gethsemane the two of them are already present and ask Jesus to join with them so he can answer their questions (above). However, Jesus explains that he needs to go and pray but tells them "I will come and talk to you Cleopas. I promise I will come to you Jairus, very soon, and we will talk about many things". After Gethsemane comes Jesus's trial and we're introduced to another figure from the Jewish establishment figure who the gospels suggest ultimately becomes one of Jesus's followers - Joseph of Arimathea. Initially Joseph is simply objecting to the unlawfulness of the trial, but when others there begin to turn on him, asking him if he too is a follower of Jesus, he goes quiet and admits he knows nothing. There's an abrupt cut to Peter who is likewise denying Jesus in the courtyard outside. Once Jesus is condemned the film moves relatively quickly to his crucifixion. 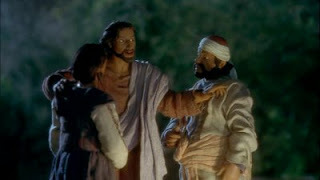 But whilst the film largely skips over Jesus's abuse at the hands of the various guards and soldiers, it does appear to show Herod pulling out a part of his beard. This is taken from Isaiah 50:6 ("I offered my back to those who beat me, my cheeks to those who pulled out my beard; I did not hide my face from mocking and spitting") which traditionally, has often been seen as a prediction of Jesus's suffering due to the other details it provides. Indeed even though there's no explicit mention of Jesus's beard being pulled out in the gospels, I believe that this interpretation was one of the reasons that depictions of Jesus began to give him a beard. From the various images that we have it wasn't until the 6th century that Jesus began to be shown with a beard. Of course the fact that Jesus was Jewish also suggests that it was likely he had a beard: the smooth faced paintings of the 4th-6th century were mainly attempts to reimagine Jesus in Roman culture. One of the things I like about this film is the way it puts things in their historical context. So this time aroundI noticed this little detail from the shot above, taken from the parable of the wise and foolish builders. 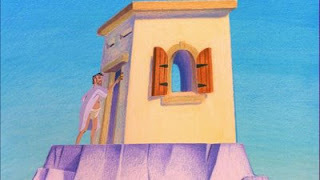 Having sweated away digging foundations into the rock so he can build his house, the wise man finally gets to enter his house. But before he does so, he stops and touches something he's put on his doorpost. Whilst this could be a door bell, or even just an attractive feature, the safest bet is that this is a mezuzah a copy of the shema encased in a box and attached to the door post. This very Jewish image sets Jesus words in an interesting context, and highlights the way that Jesus is reinterpreting his Judaism around himself. Another example of this is as the centurion at the foot of the cross witnesses Jesus's death. Instead of saying "surely this was was the Son of God" he says "surely this was was a son of god". It's been a long time since I studied NT Greek but I this is something of an alteration from how this passage is usually translated. Quite how you view such an alteration depends, I suppose, on how you interpret scripture. Some will, no doubt, be unhappy with this slight alteration from the actual words of the original. Personally though (assuming that there was an actual centurion who did indeed make such a proclamation), I think it's more realisitic that a roman soldier would have expressed himself in terms of his own pluralistic worldview, which by this point would have called the very much human Caesars sons of god. Interesting article you've got here. I've never realized that the centurion says "a son of God" - did you get that from the subtitles? Then again I've been watching the Japanese dub which is ambiguous on this matter - Japanese has no equivalents for the "a" and "the" of English. I think the Greek here is quite similar in its ambiguosity - it only has "Theou yios" or "Yios Theou". If I might add, there are already a handful of images showing a long-haired and bearded Jesus before the 6th century - though they did begin to take dominance during the 5th-6th centuries in the Eastern Roman Empire; youthful, clean-shaven Jesuses could still be found in many places in the West, only completely succumbing to the dominant artistic convention during the late Medieval period, if I remember rightly. Thanks for your comment. I got the "a son of god" just from the sound.